« From the Lomami — a Christmas Thought and Prayer. 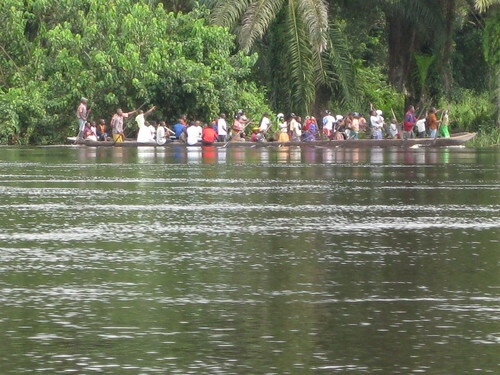 Our starting point was Katopa at the southern most navigable end of the forested Lomami River. We put in provisions for the trip, lashed the dugouts together where the river permitted and made ourselves as comfortable as possible. Pierre, a polio victim and expert fisherman, was able to provide enough dried fish for all 20 of us for the first leg of the trip. On top of empty fuel barrels was the highest lookout point. 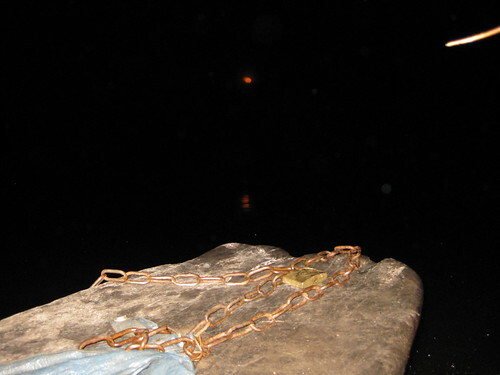 Even close to the equator the nights on the river are cold. Dino warms up with the morning’s hot coffee and pot-baked bread. 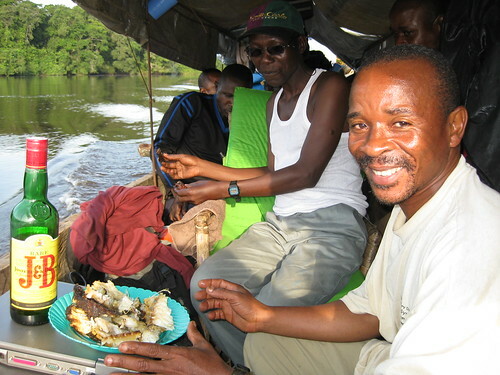 Team-leader Maurice confirms that dried fish is just fine even on the fourth day when washed down with a swallow or two of J&B. I used the trip to de-brief team leaders. We had a little generator running in the stern to keep batteries charged. 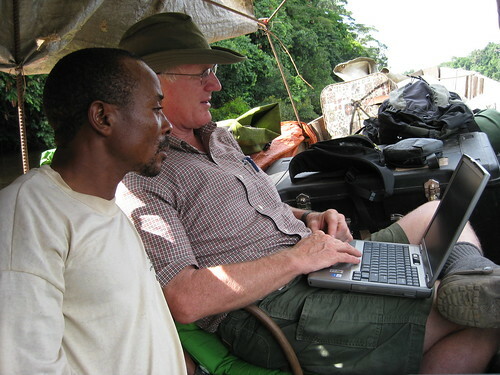 Maurice’s observations from Camp Bonobo are key to our understanding bonobo in the TL2 landscape. Working fore while the motors chug aft…. 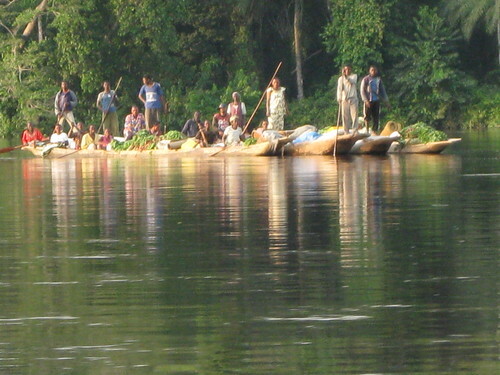 The three-dug-out armada churning the Lomami on its journey north. Feeding everyone for a week on the water is rather a challenge. We do alright for protein and starch but get a bit hungry for greens. 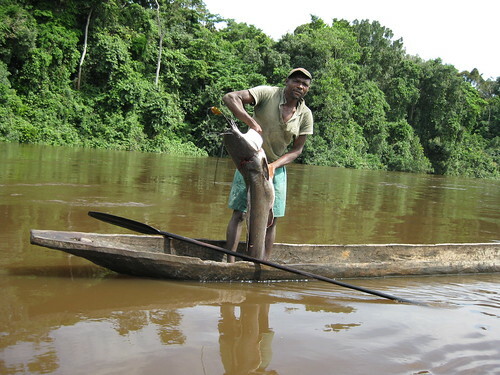 A welcome fresh meal in the form of a 25 kg catfish was offered by a fisherman north of Opala. A basket of fresh peppers and tomatoes from the Obenge gardens as well as some fowl provide a bit of diversity. When we were north of Opala we started to see other dugouts, though none of them were motorized. On a bed of clay, fishermen build a cooking fire in their dug-out. Farm produce is being paddled to Isangi market in a fleet of dug-outs. A wedding dug-out is carrying the Mbole bride to the groom’s village. In Kisangani we did a final debriefing, had a feast with staff and their wives, planned for the new year, and bid a temporary farewell. 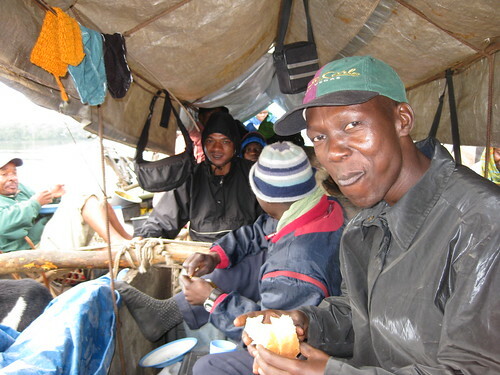 All are ready to meet again in 2009 for the dug-out return up the Lomami. This entry was written by Terese Hart, posted on 2009-01-01 at 4:37 am, filed under About the project. Bookmark the permalink. Follow any comments here with the RSS feed for this post. Post a comment or leave a trackback: Trackback URL. This is probably the smallest of things, but I couldn’t help notice that you guys run windows on your laptops. Give a linux like ubuntu a try – it’ll save you all your software costs. Abhishek, thanks for your comment. You are not the first to flag the benefits of linux for us. And we would be ready takers, but would need a nudge and some hands on advice to make such a transition. Also I dont know if some of the soft ware we use such as ArcGIS can run from linux. Can you or any other readers give further advice on this? Thank you again, and Happy New Year. Tricky to run Linux in a country where few software engineers or helpdesk are available. A bit like having a Mac in DRC: a pain in the a** for maintenance. unclear for example Allens Swamp Monkey. 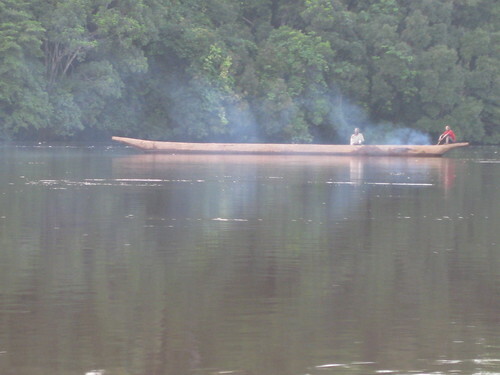 Do you know whether it exists on the banks of the lomami? Despite the common belief, modern linux systems do not need sysadmins or engineers to run. Ubuntu is one such linux, intentionally designed for the non-experts. I use ubuntu as my primary desktop and find it very stable and easy to run. But your problem, of running proprietary software does remain. I did a little searching online and found according to the article here (http://www.linuxjournal.com/content/desktop-gis-linux-introduction) that ArcGIS Server, ArcGIS Image Server and ArcIMS do run on linux, but ArcGIS Desktop does not. Instead ERIS has ArcReader available for linux which is only a reader for maps. So it really depends on your needs and use of that software, but as always, linux has open source alternative GIS software available, a list of which can be found in that article. But even if you do not find it feasible to run your GIS applications on linux, installing modern linux like ubuntu has been made excessively easy, with WUBI (installation on a windows partition without touching your current installation) being a favourite for beginners. So if you guys find the time, you can certainly give it a shot and see if other aspects of it are compatible with your needs. Ubuntu etc do have tech support available as well like other proprietary software, but as you would imagine, that is not free. Michael, thank you for your comment. I would like to learn more about your data base. A great idea I think, and possibly a good outlet for observations and data that would otherwise not otherwise be published. As for Allen’s swamp monkey: We have no observations of this species, or hunter records for the TL2 Landscape. Jonathan Kingdon shows the species extending west to the lower Lomami. 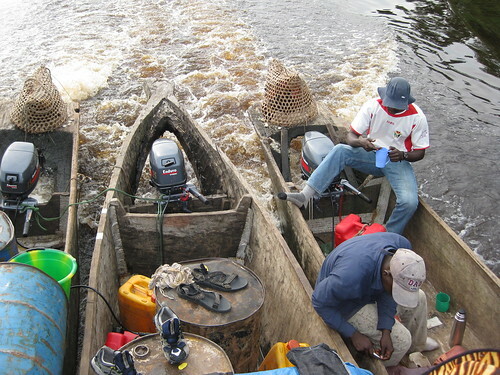 That may be possible, as swamp forests occur on the lower Lomami. 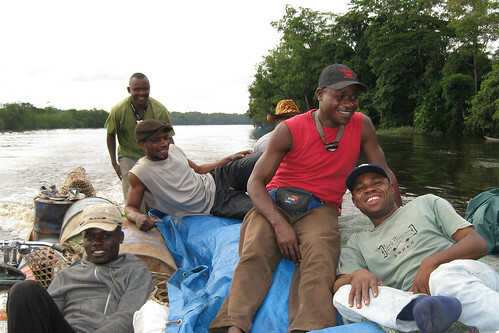 We dont have very much swamp forest along in the Lomami at the level of TL2 . 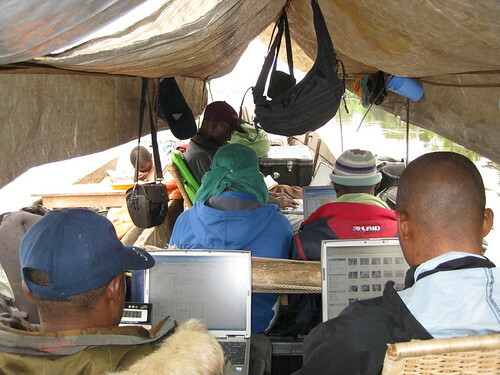 Curiously we did not find the species in the huge black water swamps between the Lomami and the Lualaba (the forest between Opala and Ubundu); Some of that area seemed to be appropriate habitat . My own experience with the Allen’s monkey is limited– I have seen it only in the Salonga NP….So I could miss this one…But I suspect the local hunters would not, and so we are not including this as a potential species for TL2. Thank you for your comment and the identification of that wonderful catfish. Seeing such fish caught by local fisherman is a gratifying sign to us that this fauna is not overfished. We have also seen some very large electric catfish. One fisherman lost a monster after it tipped his (albeit small) dugout. People fear their electric shock as well, and can only land them when they bring their dugouts to shore. I am becoming quite interested in the tiger fish as well, after I saw some nice sized specimens in Pierre’s baskets of smoked fish. We have many questions the Lomami’s fishes. Clearly a very interesting fauna. We would very much like to see someone start to work on this. …I’ll pick up on some of your other questions in your email. Thanks again Abishek for your helpful suggestions. ArcGIS desk top is one of our key software applications at present. I have heard about some of the linux GIS alternatives, but have no personal experience with them. Your suggestion to partition the HD and load up ubuntu seems like one way to get comfortable with linux, and I will give it a try. I guess I am one of those less than daring computer operators, one of the reasons why micorsoft still commands the market. at spring and the presentation of the data is via a webside. We have the goal that everybody can (indirectly) edit the db and its map via www. Why do we do this? 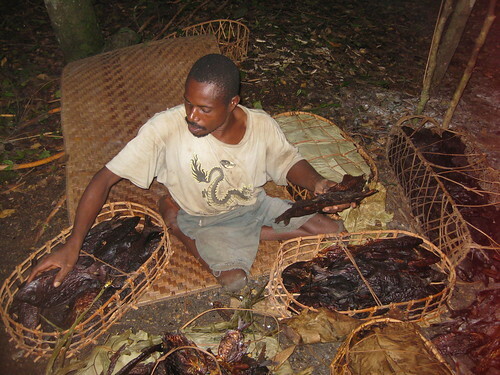 Especially the ranges of animals or plants in the congo bassin are very rough and sometimes wrong, for example the blue monkey or okapi in iucnredlist. Also allens swamp monkey is according to iucn. restricted to the left bank of the lomami. This makes no sense for this good swimming monkey, that exists at the western bassin on both sides of the huge congo. PS. Your work is a really breakthrough for biogeography in this part of the world and is so important to save parts of the most diverse landscape of the earth. Also the catfish will be very soon in the db. 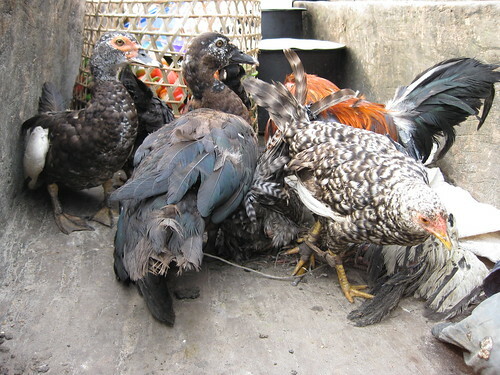 What species of duck is shown in the photo with the ducks and chickens in the boat? It does not look like typical Domestic Muscovy or Domestic Mallard. Is it a Muscovy? It does not look like any African species that I know of. Thank you all for your hard work over the years working to conserve the ecosystems and species of the area. It never occurred to me to investigate the domestic ducks. But come to think of it they are fairly diverse looking around the country…. ? ?